A massive week long event ushered into a complete new era of New Worlds Ateraan. That's right, complete player wipe! 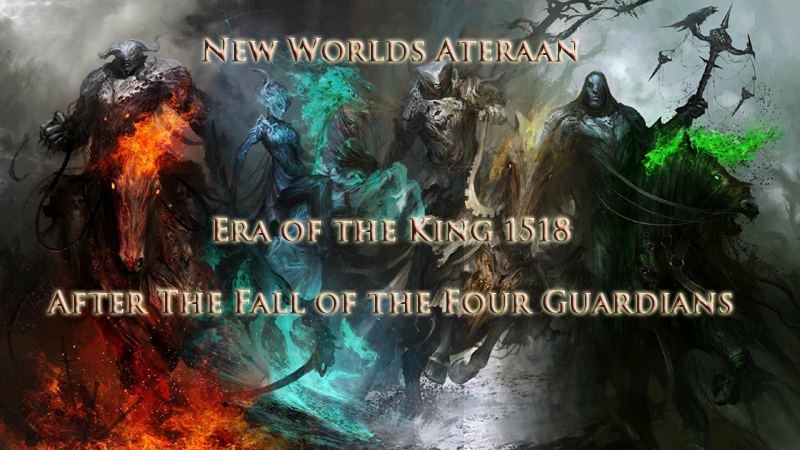 With massive New Areas and a chance to join 100's of new players at the beginning of an epic new era on Ateraan called: After the Fall of the Guardians. New Worlds Ateraan has been around for almost 20 years and is considered a TORG or Text Only Roleplaying Game. The roleplay is intense, deep, and enforced. The players are serious roleplayers and are excited to join you as the story line is epic (see next post for the story line history). When dozens of players died in a massive invasion during the Return of the Warlock (see link below) the stage was set for the new beginning. Over a 100 players started in the last two days. Join us and you can also be at the beginning to help create the future of our novel. Re: The Era of Change - Complete Reset of New Worlds Ateraan! Thousands of years ago the establishment of the Gods and Godesses came into power on the World known as Ateraan. These beings evolved from a choatic strife between what was known as the Oracle and the Enemy. Legend says that the Gods at the time were known in three realms. One being the God of the World itself, a Spirit known as Ateraan and caretaker of Nature. Another was of the Darkness, the God of Shadow endowed with power and known as Dahkoar. The third was a Woman of Light, a being of empathy and known to her followers as Waylumi. Prophets, Religious Leaders, Philosophers, and Keepers of the Lore have sometimes disagreed on the origin of the Deity and even on the Chaotic war, but one thing that has stayed consistent is the tale of the Guardians. It is said that in Ancient times the Guardians were four beings set apart by the Oracle of the Cosmos to stand as watch keepers against the return of the Enemy. These beings were known as the Guardian of the North, The Guardian of the South, the Guardian of the West, and the Guardian of the East. Each were endowed with special relics and power to form a barrier against creatures of another dimension. As time passed the location and knowledge of the Guardians fell into mystery and were not seen for centuries and only spoken about in stories by adept bards or written in ancient tomes by scholars. In the 1st Year of the King, over a thousand years ago, it is written that the Legendary Retter were throughout the land and some say they were knights of the Guardians to go forth and keep order while establishing a more powerful group of men and women against the time of the return of the enemy. Many argue over this as it is well known there were Retter both Dark and Light and they even quarreled among themselves. Despite this, the fact of Retter is true and the advent of all races of powerful beings became clear. Guilds of power sprang up in the form of Mages, Shaman, Druids, Warriors and others that lent power to those special persons that had some form of inner core spirituality. History declares that these persons were gifted by the Oracle to be champions and it seemed clear that many were. But again, this has become a topic of contention as many beings both good and evil seem to have been given this gift and battles have been fierce between them. Decades passed and with them a change in times and seasons, power, and history. Nations and Cities rose up to establish order upon Ateraan. After the turn of the 16th Century in the Year of the King, the Great Migration occurred with the city states throughout the Southland growing with the Darmahk becoming one of the most prominent. It is said those gifted with the power earlier disappeared into legend and new beings were born with this inner ability.They prospered and throughout the land beings of all manner of skill and power lent their abilities to varying Guilds, Clans, Religions, Cities, and Nations. The Warlord became well known and gained in power calling himself the King of the Southland and attempted to put all Cities of the Southland under his iron fist. For seven years prosperity reigned and it was written that the purpose of these years was for preparation of the most dangerous and mighty battle against Ateraan: The Return of the Enemy. It was at the end of the Year 1517 that the Warlock of Teciann arrived to warn of this grave peril coming to Ateraan. Without the Guardians the world would surely be lost and he called upon four individuals to take on the Mantel of the Four Guardians. They were known as Shora the Waylumi, Kyte the Commander, Warg the Warrior, and Ramketh the Dahkoar. In a mighty battle of epic destruction the Four Guardians fell, but in falling established a ward that would be the catalyst to a heroic victory for the others born of the gift. In the following year a strange occurrence happened as the gifted ones who had won the war disappeared off the face of the land. It is unclear what happened during this time by the rumours say that they left to usher into a new era of strength and prosperity. Whatever the case it is clear that they leave a mark of history upon this world as this new era begins. It's been a bit of a ride, I actually came back because of the player wipe and have really been enjoying it so far. Everyone seems re-energized and with being able to take on a new face with a fresh start was the perfect way to make a comeback. If there was a time to give the game a shot and stop on by now would be it. I fully admit, I had been burned out on the game for years. All I did was idle and listen to what was going on when the itch reared. I had tried repeatedly to get back into the game, even rolling a second character to play for a bit before retiring them once again. Things had gotten stale. However, I will admit that the news of the playerwipe saddened me somewhat. I always hate losing a character I've played for years. I was skeptical that there would be excitement for the game after the wipe, but I had an idea of something I wanted to try and she just latched on hard. Thus I rolled up a new character and have dove in. It has been a lot of fun. Most everyone is back on the same level. Everyone is helping each other out, even in the harsh city of Darmahk. People are out socializing rather than just staying with their own familiar circle. The wipe actually did some good and helped revitalize the game. Hopefully this wipe continues to bring new life and brings a new era to the game that I enjoyed so many hours playing previously. The event was a blast and a great way to end the last era. And with all the new people and things going on after the wipe I'm really looking forward to seeing how things play out. I paniced at the thought of a playerwipe. I thought that I would never be back. Then today I created a character. The newness, the freshness of it all is wonderful. For me the best thing is not having baggage and nobody else having baggage. I don't know if I'm interacting with someone who was once my character's mortal enemy or their lover. And it's great! There are new areas, and everyone is on the same relative level right now. It's a great time to get in! None of that "I'll never catch up" crap. Do it! Come give it a try! There's more people on now too, an exciting time for Ateraan! After playing the same character for several years, I had felt it was time for something new and fun, and this wipe was exactly what I needed! Losing a long-standing character was sad, and I have yet to find closure on her story...but the energy and excitement of bringing the world anew has overshadowed what sadness I might feel for the loss. There are new things being added to the world/mechanics that make everything like it was completely new! I definitely recommend joining, whether you're brand new or coming back from leaving the game. I had put several years into my old character prior to the player wipe and I along with others had mixed feelings over saying goodbye. When it was all said and done I began to realize it's like starting a brand new novel in a series of books I enjoy. I can say now that it was a good thing and I look forward to each new moment in the new Era. My compliments go out to the cook and all his hard work! "I too had a <insert issue here>, but then I came back, and <insert exuberance here>." There's only one break in that pattern above. You should learn how to shill better, guys.